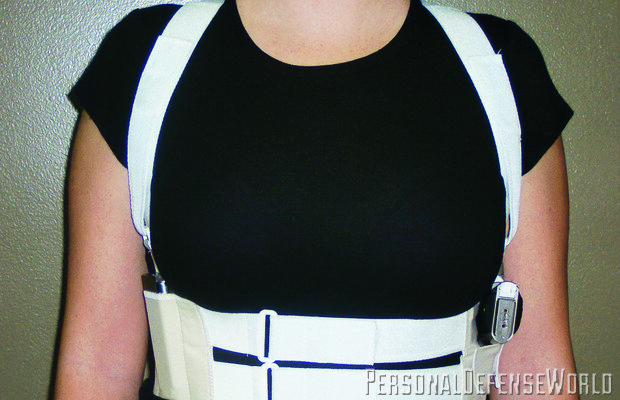 Belly band holsters can keep your CC gun very close and in deep concealment under a shirt. The Bed Bunker safe combines space saving efficiency with fast access, concealability and a massive amount of secure storage space. Rapid access! Also new from Stack-On is the compact QAS-1200 biometric model. Gun Vault provides fast access for a single pistol in the ready position and it can be mounted anywhere. Take advantage of unused space with Handgun Hangers from Gun Storage Solutions. If there is one industry that continues to do well despite tough times, it is the gun business. With all the guns that people like me keep buying, the need to store and transport them safely and securely while still having quick access in case of urgent need is also growing. Everyone’s needs in this regard are different of course, so presented here is a brief round up of a selection of products that should fit most anyone at home or on the road. Even if you are used to carrying a gun on your person with your concealed carry permit, chances are you don’t do so while you sleep. If immediate access to your personal protection handgun is your primary concern at night, you may want to look into bedside holsters. The BedSide Backup from CrossBreed Holsters offers a good solution for keeping your self-defense gun literally at arm’s reach from where you sleep. This spring steel black-finished kit is a two-piece L-shaped design that fits neatly between the mattress and box spring on your bed. The two parts fit securely and can be easily separated for easy storage or transportation. The side that goes against the box spring has a Velcro covering that allows you to attach the included CrossBreed Ohai Kydex holster in your preferred orientation. One custom fit holster is included, and you can choose from an extensive list to find the right one to fit your gun. A separate extra magazine holder is also available, and a flashlight holder will be available soon. Both likewise attach to the BedSide Backup via the hook and loop system. The advantage to this system is that you can take it with you when you travel and keep your gun in the same place as you are used to at home, regardless if you are in a hotel or some other unfamiliar place. DeSantis Gunhide has also entered the bedside gun holster fray with an innovative model that takes into account different thickness mattresses to allow the user to adjust the holster height and cant. The Mattress Tuk holster, made from Kydex, allows the use of most any holster fitted with a spring clip, common with inside the waistband (IWB) holsters. The advantage here is that users can keep their carry gun in their holster and simply transfer it from concealed carry to mattress carry for sleeping and back again in the morning. Keeping with the bedtime quick-access self-defense theme is the versatile and cleverly simple Bedside Buddy. This tough, one-piece polymer unit also fits neatly and easily between the box spring and mattress on your bed and features a simple plastic post that sticks up about 1.5 inches. The muzzle of any gun above .380 ACP in diameter easily slips over this post and is held securely in a grip-up position. It can be placed anywhere along the bed where your hand can naturally reach down for very fast access. The Bedside Buddy does not cover the trigger at all, so exercise caution when drawing. It should be noted that neither one of these devices constitutes safe storage, as they merely hold your gun within easy reach while you sleep. The box spring on your bed is really just a lot of wasted space—space you could use to store more guns, thanks to the BedBunker safe. 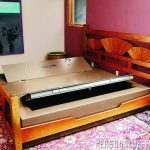 This solid 10-gauge steel-walled horizontal safe lets you keep guns secure and hidden under your mattress. In fact, each section will hold as many as 35 rifles and shotguns and 70 handguns on two internal shelves, and you can double the storage space by using two units together. I have standing safes, and they take up a lot of space in a closet, basement, or other room. They are also neither subtle in appearance nor very convenient to access. 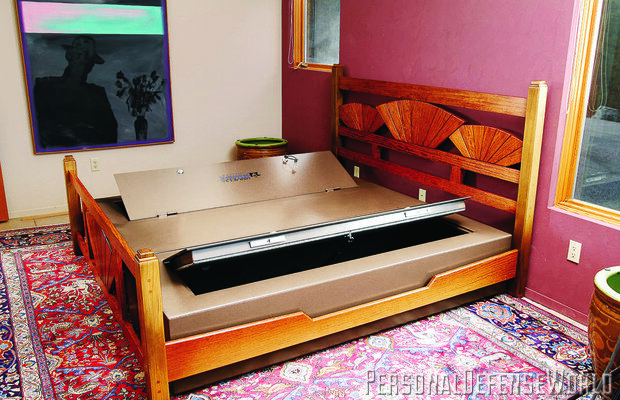 The BedBunker, by contrast, gives you pretty quick access at nighttime: just push the mattress to one side. The .25-inch, 140-pound steel door has a gas-piston system to help open it and an internal security bar prevents access if the hinges have been compromised. You can also internally bolt two units together under a king or queen sized bed, and there is no way someone is stealing that whole safe! This is a serious, no nonsense safe, with a two hour firewall to protect your guns, valuables, and important documents, and it features a thick felt lining to prevent scratches or damage on the finish of your guns. Each section weighs 650 pounds empty, so make sure your floors can handle that. You may lose your keys or forget your combination, but it is unlikely that you will misplace a finger, and that’s all you need to quickly access your gun inside a biometric safe from Stack-On Products. Several personal safes with this new and improved technology are now available which can securely recognize programmed fingerprints and reliably open time after time. These safes allow for up to 32 different fingerprints to be programmed, allowing different people access or for the polydactyl. For backup, they also include an electronic touchpad and hidden trouble key to ensure you always have access when needed. Your choices include the large safe with two removable shelves which is over 20 inches tall, the standard safe with one shelf, the top-opening drawer safe with an internal list to keep the top open, and the extra wide safe suitable for a laptop computer and other valuables. All of these Stack-On biometric safes have foam lining to protect the contents and are constructed of heavy-gauge solid steel with pry-resistant plate steel doors. They also feature steel live-action locking bolts and concealed hinges to keep your firearms safely within reach. Throughout history technological innovation has allowed us to become more and more productive and is responsible for the invention of new terms like multi-tasking. Certainly those in the firearms and security industries have not been slouches in regards to innovation and improvements, but the folks at Pistol Pad have taken the principle of multi-tasking, at least when it comes to home security, to a whole new level. 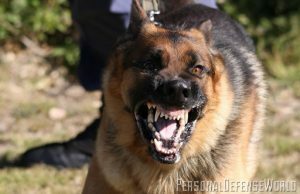 Many gun owners and other personal security conscious individuals have home security systems. 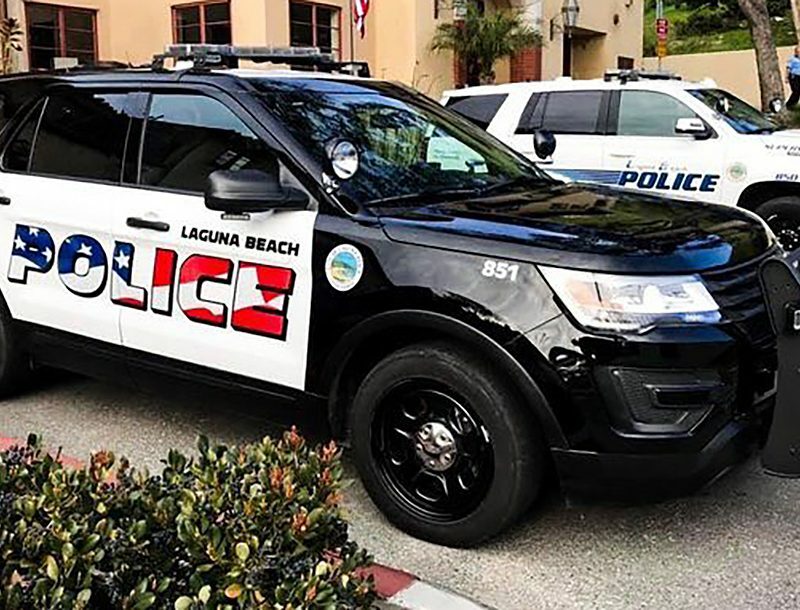 These will not only sound an alarm but also immediately notify a monitoring company that a breach has occurred so that law enforcement or other emergency personnel may respond if needed. Gun owners have the additional concern of being able to secure their firearms but have quick access to a personal defense gun as well. 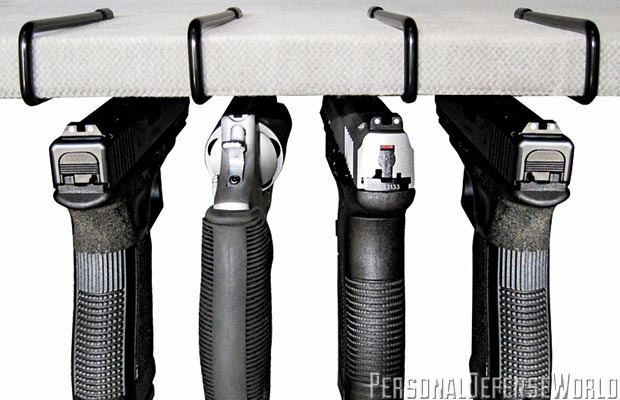 Pistol Pad now allows individuals to combine both needs into one solution. This unit is easily integrated into an existing home security set up by using a wired or wireless remote transmitter (such as a window sensor). The pad itself uses a sensor loop through the gun’s triggerguard that easily detaches when the gun is moved, breaking the circuit and setting off the home alarm system. In case of a home invasion the gun owner simply reaches for his firearm which prepares him or her to deal with a threat, sets off the alarm system to alert an intruder that they have been discovered and notifies the monitoring security company to contact law enforcement. The Pistol Pad will also set off the alarm system if someone tries to tamper with it or move it. This can provide added security against gun theft as well. The Pistol Pad can be deactivated via a special code in your alarm system or with the provided key and is small enough to fit in a drawer. Even non-gun owners may benefit from the ease of use of this system and could combine it with flashlights, pepper sprays or other defense tools. 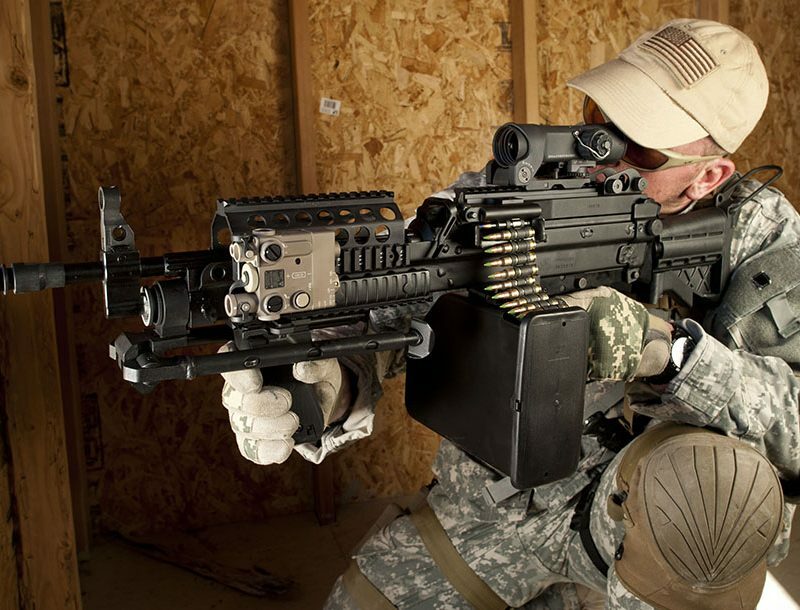 The company is also developing a similar system for use with shotguns or rifles. The Pistol Pad alone is specifically “a panic button for your defensive handgun.” For those seeking more limited-access security, the Pistol Pad Storage System provides at least 12 different options of handgun storage. For convenient, safe and secure storage for handguns in the desk, home or office, GunVault’s new SpeedVault is worth a look. 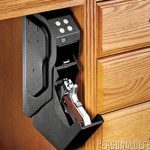 The SpeedVault is a drop-down safe that can be mounted under a desk or in various locations for a variety of concealment with a holster-like protective foam lined interior. It offers a combination of theft protection and fast, reliable access. The SpeedVault is made of 18-gauge steel and is available as a digital-lock unit or biometric fingerprint scanner (SpeedVault Bio). An activation button triggers a spring-loaded door that has a high-strength lock mechanism. Foolproof security is ensured with an audio and LED low-battery indicator to help guard against direct tampering and unexpected power loss. Mounting hardware is included. The SpeedVault weighs 6.61 pounds and is powered by one 9V Alkaline battery. Keeping firearms secure and free from any damage, especially while transporting them, is a major concern for many of us, but now with International Supplies’ new Armortek Rifle Case, you can do both with ease. This full-length case will accommodate most any rifle or even up to two rifles with scopes attached, and it is designed to offer protection against unauthorized use or theft at home or on the road. The top and bottom lids are lined with 13-gauge steel mesh, which prevent someone from cutting through, while steel side guards protect from pry and crowbar attacks. The entire perimeter of the case has a 6-gauge steel band for added strength and includes a steel cable lock to secure the case to a stationary object. Internally, the contents are protected by thick memory foam that keeps objects in place. Another new and very innovative safe that provides good storage at home and on the road plus fast access is the Titan Gun Vault. 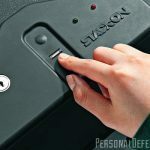 This steel combination safe can be mounted in a bracket in your vehicle and has a separate steel box to store ammunition. Unlocking and opening the safe causes the gun and a magazine with ammunition to pop up and the pistol can be very quickly made ready. The safe can also be easily removed from the bracket and transported to home or range. 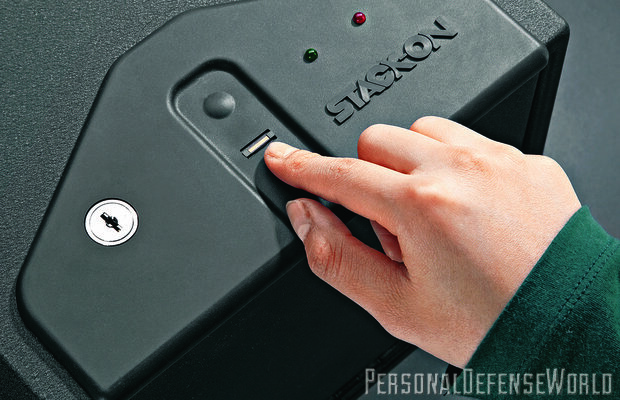 This quick combination safe is made from 14-gauge steel and is large enough for most handguns. Deep Conceal has taken the shoulder holster concept to a new level with their company’s Ultra Carry Double Strap Concealed Carry Holster. It is made from a soft cotton fabric and features dual elastic straps in the front with velcro-adjustable loops as well as dual suspenders, which also have velcro adjustable straps. The main advantage of this holster is that is allows the wearer to keep their gun very close under their armpit underneath a shirt for almost complete concealability. Having tried this holster I can say that it is also very comfortable and can be worn under any shirt in any type of weather. The only issue is getting quick access if one were wearing a buttoned shirt over top, especially if the shirt is tucked in. However, you have to unbutton your shirt in order to gain access to the gun, which is not conducive to quick access. To solve this problem Deep Conceal also has a new CCW shirt that features Velcro closures behind fake buttons so that very fast access is possible. My wife says that if I am running out of room in my safe, it is time to stop buying guns, but I think she is crazy and that I just need to be better organized. Now thanks to Gun Storage Solutions, I can make a lot more room and keep my guns from getting scratched or damaged. The Handgun Hangers product line, as the name implies, is an organizer designed specifically for all types of handguns, and the different models make use of every inch of available space in your safe. The heavy, rubber-coated steel cable wires hold handguns in place though the barrel and either hang down from the front or rear of a shelf. One unit, the Over-Under Handgun Hanger, allows you to store one gun above and one gun below a shelf simultaneously. 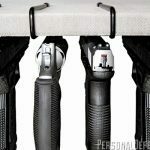 Gun Storage Solutions also has a convenient system for increasing long gun storage space with their Rifle Rods which attach to the inside top of your safe with hook and loop tape and have a long plastic rod that goes inside the barrel to keep long guns upright, instead of leaning against each other. 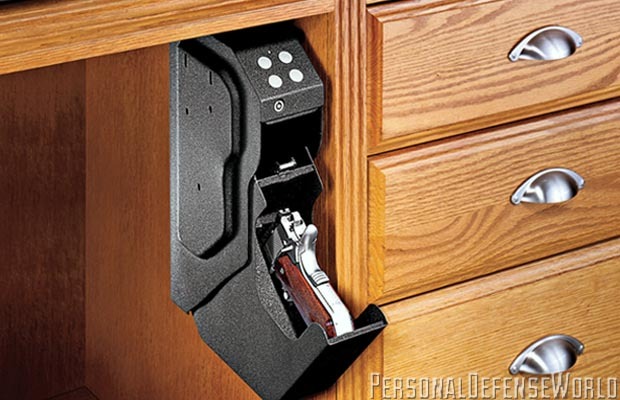 This not only protects your guns from scratches, but also makes better use of your available space. There is no excuse for unsafe gun storage, and with so many options, anyone should be able to find something that works.